Seven has launched a Home and Away app for viewers to investigate the shooting of character Charlotte over the summer. Who shot Charlotte? The mystery will cast a shadow over Home and Away fans this summer as speculation mounts on who is responsible. Not content just to allow fans to keep themselves busy until the series return, Seven is engaging viewers online on two fronts, with the launch of Presto’s Home and Away: An Eye for an Eye and the Home and Away Investigation app. Both follow last night’s season finale where newlyweds Leah and Zac’s happy day ended with the shocking murder of Charlotte. Home and Away: An Eye for an Eye centres on the Braxton family and will see the special guest return of Heath and Bianca to Summer Bay. Ricky has found out that Brax is alive and now his arch nemesis, Gunno, is coming after her and their son. When Casey is kidnapped in a shocking act of revenge, family and friends must reunite in a desperate race against time. The exclusive Home and Away special event is Presto’s first local commission and is now available to stream. The Home and Away Investigation app will allow fans to take the lead in the investigation of Charlotte’s murder. 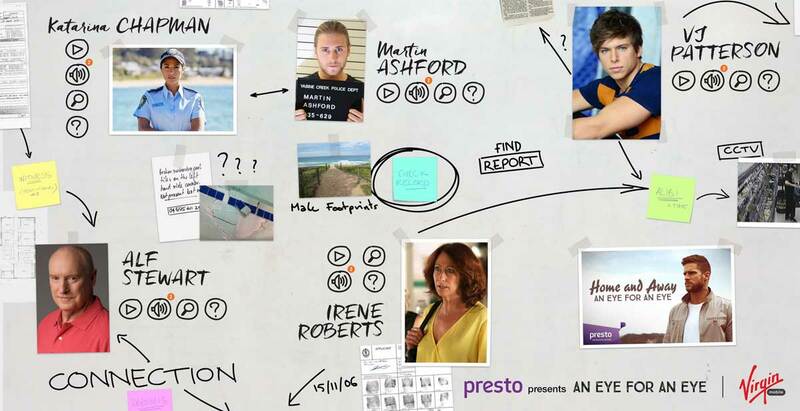 Users of the app will be able to narrow down 24 Summer Bay suspects and eliminate someone from the investigation each week, based on the evidence they find. Users will be able to interrogate suspects by asking them questions; use decoders to crack pins and unlock access to phones and content, and unscramble audio messages to listen to voicemails or phone calls. After nine weeks, the top suspects will be revealed and the 2016 season return of Home and Away will continue the search for Charlotte’s killer. Home and Away returns to Seven in 2016 after the Australian Open.